The Division of Cardiology provides primary through tertiary care to adults with cardiovascular disease in the Halifax region. As a tertiary care referral centre, we also care for Atlantic Canadians with complex cardiovascular issues. We work together with the Division of Cardiac Surgery and the Division of Vascular Surgery, Department of Surgery and Nova Scotia Health Authority to diagnose, treat and provide care to patients. Atlantic Canadians have disproportionately high incidence and prevalence of cardiovascular disease. The resulting clinical demands necessitate patient care based on the latest research and evidence, creative thinking, flexibility and a willingness to do things differently. These are hallmarks of the Division of Cardiology. The result is excellent patient care and meaningful learning experiences for residents, students, fellows and practicing physicians. The Maritime Connective Tissue Clinic, part of the Maritime Heart Centre, is a multidisciplinary program that cares for patients and families with genes that cause aneurysms and connective tissue disorders. The team of faculty members, nurses and healthcare professionals at the Nova Scotia Health Authority and the IWK Health Authority offer residents and medical students opportunities to learn the most innovative clinical assessment, treatment and management practices. The Heart Function Clinic provides education, and dietary and lifestyle modification support to patients with heart failure. Learners benefit from hands-on learning and exposure to the progressive care model. The Heart Function Clinic includes a cardio-oncology clinic dedicated to the assessment, investigation and management of the cardiac complications related to cancer and cancer treatments. 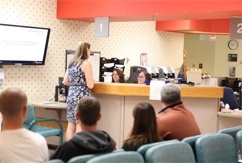 The Heart Rhythm Service provides comprehensive care to patients in the Maritime provinces, conducts leading research and educates learners, including medical students, residents and fellows. Its clinical efforts encompass inpatient and outpatient care delivered by a number of clinics: general arrhythmia, arterial fibrillation, inherited heart disease, post ablation, and implanted electronic devices and pacemaker. The advanced Beth Medjuck Heart Rhythm Laboratory is a cornerstone of the Heart Rhythm Service, enabling invasive and therapeutic heart rhythm procedures including electrophysiology study, catheter ablation and cardiac implanted electronic device care. It also enables the team to conduct local, national and international research studies and provide excellent learning experiences. Inherited heart diseases can lead to unexpected sudden death, even in children and young adults. The Inherited Heart Disease Clinic assesses patients and families from the Maritime provinces. The clinic includes cardiologists, nurses, geneticists and genetic counselors who provide cardiac care, genetic testing, prevention advice and therapies and conduct research into improved diagnostic and management strategies. The team provides the most innovative non-surgical treatments for the management of coronary artery disease, and congenital and valvular heart disease. This includes about 4,000 diagnostic cardiac catheterizations and 1,800 coronary interventions annually. Community Cardiovascular Hearts in Motion is a best practice- and research-based program developed to decrease polyvascular risk factors through health behaviour changes. Cardiovascular & Pulmonary Health in Motion, offered in partnership with Hearts in Motion, provides personalized exercise, nutrition and education programs for secondary prevention of cardiovascular disease. It also includes a pulmonary rehabilitation program for people with chronic obstructive pulmonary diseases.